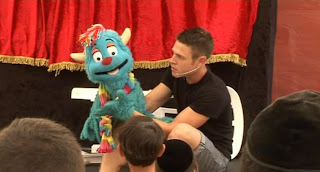 Continuing our series of unusual and unexpected places and activities in Israel, today we visit the Israel Puppet Center in Holon, a suburb of Tel Aviv.The 14th annual International Puppet Theater & Film Festival recently took place there. Holon, a child-friendly suburb of Tel Aviv, is one of Israel's puppetry hubs. Each year since 1997, the Israel Puppet Center there presents the Holon International Puppet Theatre & Film Festival. The festival showcases workshops and shows for children and adults. "Our festival offers something for everybody. So that means, for children and for adults," says Ilan Savir, artistic and general director of the center and the festival for the past eight years. The Holon facility also houses a puppetry school and a museum. This year, in addition to Israeli groups, the festival included performances by the Figura Puppet Theater from Iceland and the Happy Puppetry Company from Taiwan. Join us in a visit to the Israel Puppet Center with one click below. Enjoy!